As I sit here rubbing the ears of a nine week old pup, I can’t help but dream of what this little guy will be doing during the next twelve months. It was only a short twelve months ago that my wife encouraged me to get a pup for our eleven year old son, Taylor. After a quick weekend search, a thirteen week old pup was located and we were soon on the way to Tulsa, Oklahoma to rendezvous and pick up a field bred English springer spaniel pup. As all pups are, this one was full of potential. He was already retrieving quite well due to some consistent work and attention from Brad Mirth, the breeder. Taylor spent the summer playing with the pup, Spud, helping to socialize him. We went to the training days for the Southwest Missouri Retriever Club to give them exposure to birds, dogs, people and marked retrieves off winger launchers. Spud showed plenty of drive to go whatever distance it took to make a retrieve. Taylor enjoyed watching Spud do what the retriever breeds were doing. As the Summer turned into Fall, Spud accompanied me and the grown dogs on dove hunts, woodcock hunts and pheasant hunts. Nothing seemed to phase him. He was easy to control and always completed his retrieves in style. Along with the experiences of hunting and learning to work cover - plus the training days with the retriever club, Spud was well on his way to becoming a nice hunting dog. "The ribbons and titles are nice to keep the kids motivated - but it’s the kids that will keep our sport alive for years to come." Taylor was not able to spend a lot of time working with Spud through the winter due to the short daylight hours, school work and other activities. Because of the lack of work from Taylor, I was more concerned with his handling than Spud’s retrieving. 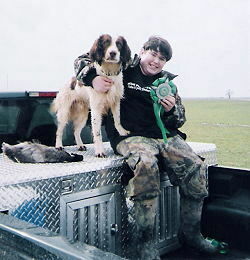 However, in February 2005, I took Taylor and Spud to the L’Anguille River HRC hunt test in Jonesboro, Ark for their first HRC Started Hunt Test. The first retrieve was a classic. I was video taping back behind the "line" with a water filled ditch between me and the edge of the rice field. Spud nails the first mark and comes running hard back to Taylor. Spud starts the parading routine around the judges and then comes across the ditch and circles me. The judge politely asks me if I wouldn’t mind coming over to the line so the dog would stay closer to the handler. With me standing close by, Taylor was able to get the duck from Spud and then get the dog ready for the second retrieve. Spud stayed close on the return with the duck and on the second or third circle, Taylor gabbed the duck’s neck and took the duck from him. Three hours later, Taylor was wading through the mud and water as he ran Spud in the water series of the test. It was set up on a rice field that still had some water in one corner. On the second mark, Spud was looking out into the field while the duck was launched to the far right. When the shotgun was fired, Spud knew a duck should be in the air and started looking for the bird. Spud looked just in time to see the duck make a huge splash in the water. Believe me, I was holding my breath hoping that he would look in time. The retrieve was completed and there were a few sighs and comments about the "million dollar splash". Later that evening, I was beaming with pride as Taylor received his first ribbon for the pass. I had a feeling this was going to be a fun year but didn’t realize just how much fun. The next hunt test was held at the Deer River HRC hunt in Alamo, Tennessee. Taylor and Spud failed on Saturday due to an unusual circumstance with a decoy. But they rebounded on Sunday with their second pass. They had two passes down and two to go for their started hunting retriever (SHR) title. 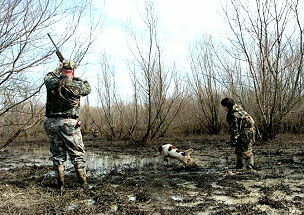 On April 2nd and 3rd, 2005, the Southwest Missouri Retriever Club held its HRC hunt outside of Springfield, Missouri. I was fortunate to get to watch Taylor and Spud in action at our home club’s hunt test. They completed the retrieves in style and by now, Spud was doing less parading and working better for his young handler. Taylor was becoming more confident in Spud and he was really getting hooked on running tests. They passed both tests and Spud was awarded the started hunting retriever (SHR) title from the HRC (Hunting Retriever Club) organization. Spud happens to be the first dog in our family that has actually completed a title of any kind. Little did I know three years ago, as I worked with some other guys getting the retriever club organized, that my son would participate in a hunt test hosted by the club and put a title on his dog. Sometimes you just never know what kind of impact you are making on others - and even on your own family. The title weekend was a special occasion but there was more tests ahead, with no time to rest. 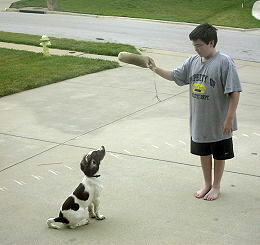 In just two weeks, the Springer Spaniel Club of Central Kansas was going to hold its AKC Spaniel Hunt Test. Taylor and Spud were entered to run the junior test and they had work to do to get prepared. Well, the weather didn’t cooperate and, again, school activities and homework were demanding Taylor’s time. Finally, a few days before the test, I got Taylor and Spud away from the house and let them walk through a field and find a couple of clip wing pigeons. Up until now, Taylor had never taken a bird smaller than a full grown duck from Spud. Taylor did ok and felt comfortable that he would know what to do at the spaniel hunt test. We made the drive over on Friday and arrived in time to do a quick training run. Taylor did not want to run Spud so I got him out myself. Spud did fine flushing two pigeons and retrieving one. The other was a fly away and Spud came back in short order and continued to hunt. I was anxious all night wondering how the two of them would do on Saturday. When Taylor was called to the line, I promise that I didn’t breath again until they were finished. Spud covered his ground well, not necessarily in a sweeping pattern, but did a workable job. The first bird was missed and the springer returned promptly. The second bird flushed and flew behind the gallery. When it was scratched down, the bird fell almost to the ground then sailed off line about 10-15 yards and downwind. Obviously, Spud thought he knew where the bird went down so he stayed in the area and really hunted hard for the bird. The judges asked Taylor if he wanted to move up to help Spud - and so they did. When Spud saw Taylor coming out, he punched out a little farther and eventually got downwind of the bird. Once the bird was located it was quickly brought to hand. Taylor walked off the line saying, "Now, that was fun!" The water retrieve was later, after lunch. Spud loves the water and completed the retrieve quite nicely. Sunday was another nice day for the pair. Spud just does what he knows to do. He has been a good dog for Taylor to learn how to get through hunt tests. They finished the spring hunt test circuit with four HRC started ribbons and a title, along with two junior hunt passes toward his AKC junior hunter (JH) title. The ribbons and titles are nice to keep the kids motivated - but it’s the kids that will keep our sport alive for years to come. Kids don’t seem to get as nervous and uptight about the tests as adults do. They are doing it for fun and enjoy just being around the dogs and people. I really enjoyed watching Taylor and Spud during this past few months. Now we need to work on getting Spud ready for the seasoned level HRC tests where Taylor will handle a gun and shoot birds while Spud stays steady and marks double retrieves. This is where the fun really begins and Spud becomes a nice hunting dog. Taylor is already talking about running Spud in the master hunter level of AKC spaniel tests. No need in stopping at the senior level if that is where he is wanting to go. Due to the activities of other kids, school activities, soccer, etc..., I don’t know when we will get to another AKC hunt test. However, I do know that I have given Taylor a chance to see if he likes playing the dog games. If Taylor and Spud do go for more passes, I know that I will be there watching - and holding my breath - until the last retrieve is made. Tim Baker has been playing with English Springer Spaniels since 1984. 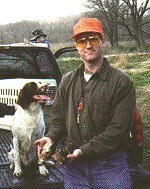 He has two Springers currently, Jake and Kasey, which are his hunting companions. They have received some AKC and HRC Hunt Test ribbons. He is a self-proclaimed woodcock addict but his hunting buddies agree with him wholeheartedly. There are few things he enjoys more than chasing these mysterious birds with energetic spaniels. Tim is married to a very understanding wife who LOVES to shop while he is playing with the dogs. He has three kids that have learned to put up with Dad and his dogs.